I have so many posts scheduled before this one but I was so excited to post this snack that I made that I readjusted. I LOVE mangoes. I LOVE watermelon. When it so happened that I had them both in my kitchen at the same time one day I had no choice to put them together as a dish. It's summer and South Florida is in abundance with fruits. A friend gave me a mango that was just about mid stage.. or half ripe (or half green if you are negative... lol) During my restocking of my pantry over the weekend, I bought a seedless watermelon.. I decided on making a Pico de Gallo (of sorts) with my fruits. Pico de Gallo is a Mexican dish that is basically an uncooked salad. 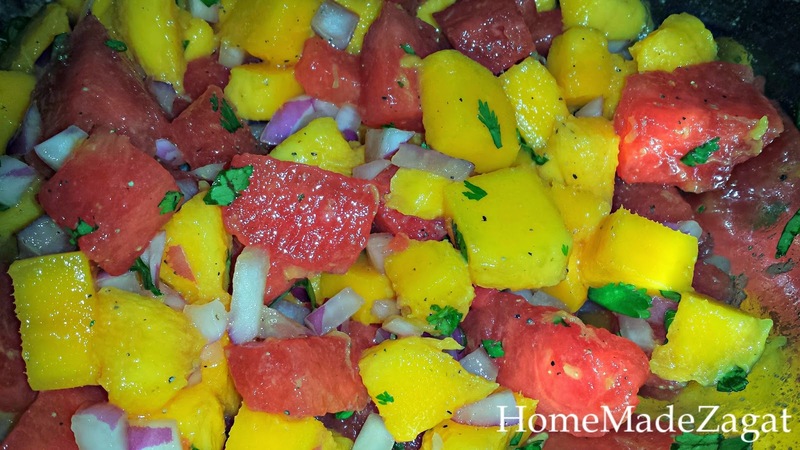 It has various components which can include from tomatoes, white onions, peppers, firm mangoes, cilantro, lime juice and even add sausage and other meats. 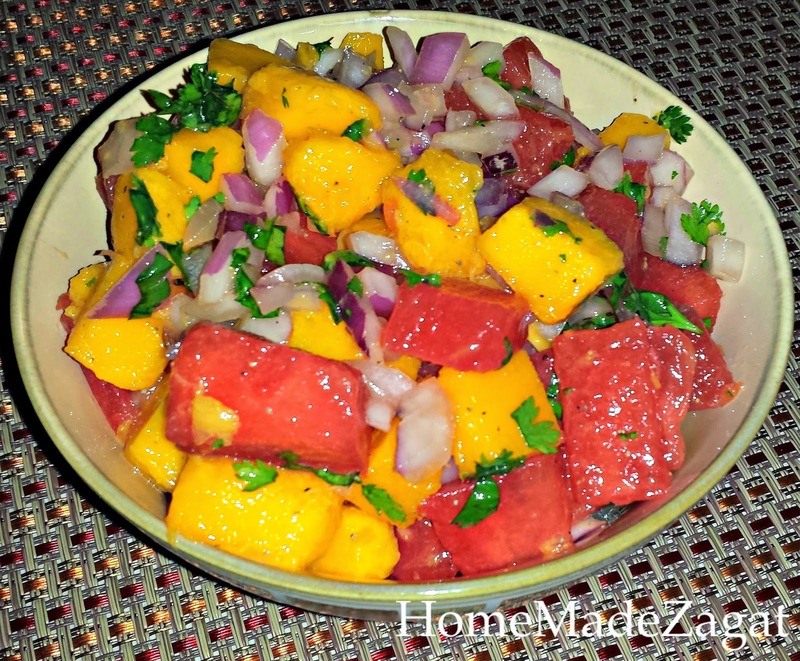 I opted for a simple one with just my fruits, some red onions, lime juice and cilantro. I mostly eye balled it. 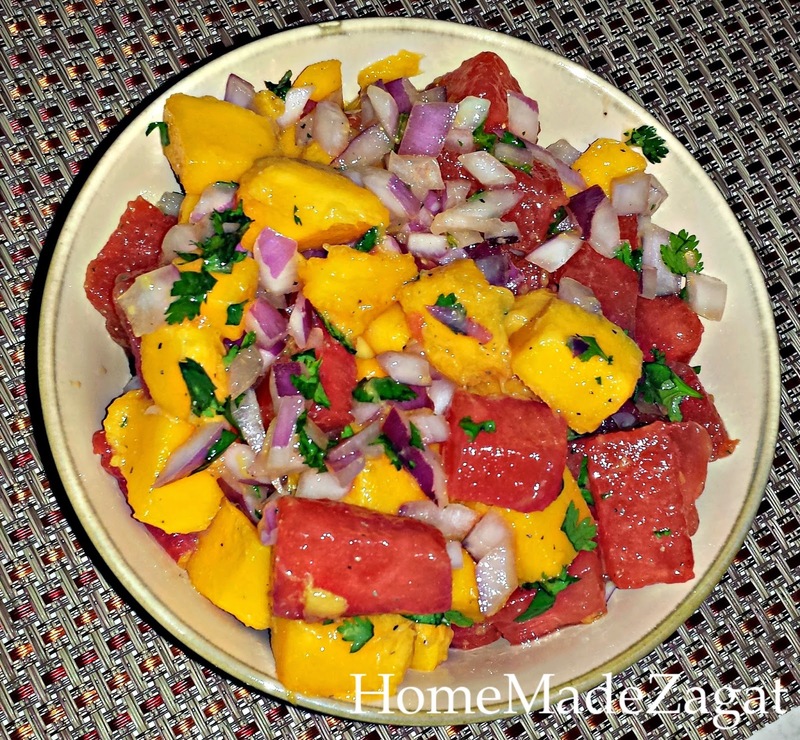 I used all of my mango obviously and added enough chopped watermelon to equal the amount of mango. I left my fruits in chunks because I know I just really wanted it by itself. 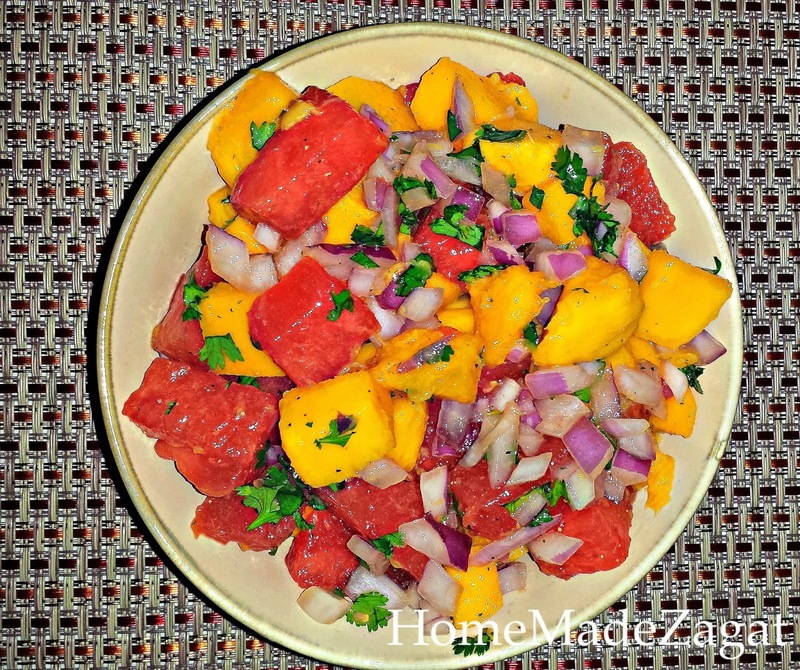 If you want to use it as a salsa you can make the sizes of the fruits smaller. I then added my finely chopped red onions, and cilantro. Squeezed the juice of half of a lime and mixed everything together. After tasting I felt that it needed some salt and black pepper. I added about a pinch of each. This took about 10 minutes to prepare. I love the taste of the lime with the sweetness of the mango and watermelon. And the onion just gives it a nice kick. If you are a fan of pepper you can add a jalapeno to the mix, cutting it up in slices. I took this to work today and my guinea pigs co workers killed it. It's a great little snack but please ensure you do have a mint around. Cilantro and mint are kickers. I can also imagine this (in smaller bites) topping some fish... yum.